A block of watchmakers cottages in Coventry are to be demolished to make way for a road widening scheme, despite community groups being told that no such scheme was being planned. Public consultation is to start shortly on a suggestion to demolish Stanley Terrace as part of a bus showcase scheme running from the city centre to Tile Hill. A major problem facing planners is a bottleneck at the junction between Hearsall Lane and Allesley Old Road. Traffic builds up there at peak hours and there is not enough room for a dedicated bus lane to allow buses to jump the queue. A variety of proposals are being put forward by Coventry City Council to get around this problem. 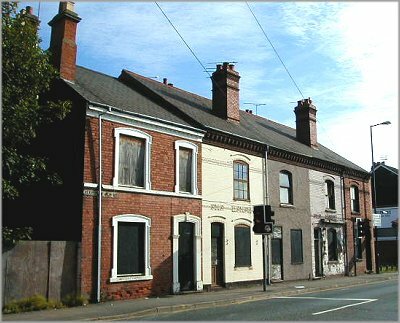 They include demolishing a row of empty houses called Stanley Terrace, in Allesley Old Road to widen the road at the junction. But members of the Spon End Forum say they have been told for two years that no such plan is being considered. Malcolm Adkins of the community group, which draws together interest groups from all over Spon End, said he was about to start campaigning for the terrace to be renovated when he heard about the scheme. Now, instead of calling for the former watchmakers� cottages to be restored, he faces a battle to ensure their survival. �We have been arguing that there should be another way of doing it but we were told that there were no plans for it. "These were Watchmakers Houses, which at one time contained the offices of the Coventry Watchmakers Co-operative. "This group figured prominently in the recent Channel Four Time Team programme on watch-making in Coventry. Mr Adkins said the buildings could be brought back to life and used to provide much-needed family-sized houses. "Recently a new group has established itself under the umbrella of the Spon End Building Preservation Trust. "This group is intending to purchase Victorian and Edwardian houses in the Spon End area, largely to make family houses available to young couples that we know want to move into the area, but are prevented at present by the large amount of houses illegally subdivided into bedsits. �The result is that we do have a team with the right skills and experience to take over, renovate and manage or sell properties such as this. "We are confident that we can raise the money that would be needed. The scheme would be an economic one that would not need any grant aid and which would show a return for the council."